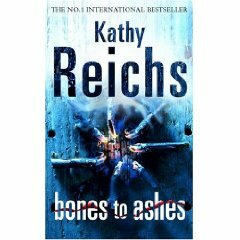 Bones to Ashes by Kathy Reichs – It's Time to Read! The skeleton is that of a young girl, no more than fourteen years old – and forensic anthropologist Dr Temperance Brennan is struggling to keep her emotions in check. Detective Andrew Ryan is working a series of parallel cases, and requires Tempe’s forensic expertise. Three missing persons, three unidentified bodies – all female, all early-to-mid teens… Could Tempe’s skeleton be yet another in this tragic line of young victims? Or is she over-reacting, making connections where none exist? Working on instinct, Tempe takes matters into her own hands. But she couldn’t have predicted where this investigation would lead, or the horrors it would eventually uncover… Can Tempe maintain a professional distance as the past catches up with her in this, her most deeply personal case yet? I have only just started reading crime novels and this is the first Kathy Reich’s book I have read – and it certainly encourages me to read more of this genre and more of her work. In this novel, Tempe is working with several skeletons – most of them from Ryan’s missing girls and cold cases. Except, it all gets a little personal. When a young girl her friend disappeared without a trace, and Tempe worries that one of the skeletons is her friend. With this in mind, she and her sister start their own investigation, which leads them into danger…. This was an exciting book with plenty of turns and twists and I didn’t work out the ending. It seemed very realistic – full of scientific knowledge and crime knowledge. Reich’s writing is engaging and gripping. She writes about more than just the crimes, there is love and friendship and family explored too, adding depth to an already good book. Through these she is able to explore the characters more fully. My only complaints were lots of the conversation was in French, which then had to be translated, and there was so much science I didn’t understand! Other than that, this was a good book and well worth reading.